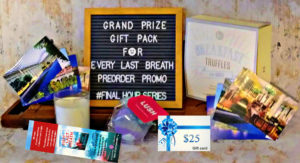 The Every Last Breath pre-order campaign, aka the Final Hour bonanza, is a go! The book comes out 4/30/19, and if you pre-order any time between now and 4/29/19, you’ll receive some fantastic goodies. Pre-orders are a tremendous help to authors and publishers look at these numbers closely. These gifts are my thank you for your support. This is open to my international readers. International readers are eligible to win a grand prize. 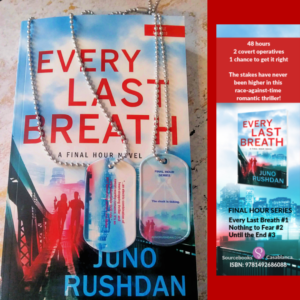 If you request that your local library order a copy of Every Last Breath, email me a screenshot of your request and I’ll send you a bookmark, the digital swag pack, and a maybe the military style dog tag! Orders of any format of the book are eligible to receive pre-order gifts. I’ll be sending all gifts between April 15 and May 15 2019. 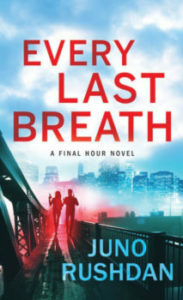 Exclusive sneak peek of book #2 won’t go out until May 15 to give everyone a chance to read Every Last Breath first. I don’t want to spoil any of the fun for you. I plan to respond to all emails, so please let me know if you haven’t received a confirmation email. Once again, please send proof of purchase/library request to [ junorushdanpromo@gmail.com ]. Proof can be an attachment, pasted in the email, or a forwarded email confirmation from the retailer. From the bottom of my heart, thank you. I’m dying to share this book and these goodies with you!